Part of our work in exploring the history of the colliery site itself is to shed further light on the history of the local area, the businesses, places of work and lives of the people that worked in them. We hope these ‘spotlights’ will be interesting and perhaps trigger further comments and discussion as we go. As any volunteers and visitors will no doubt be able to tell you, the pit is certainly blessed with a wondrous variety of bricks – engineering, hand-pressed, bull-nosed, old and new, both marked and unmarked. Different makers names sometimes indicates where there have been a number of different phases of building across the site; whether for boundary walls, new buildings, ad hoc structures, repairs and other purposes. Amongst the makers names which people local to the area may remember, we see many examples of “Hoyland” and “Kilnhurst” bricks, and also a large number of “EFW”s – Earl Fitzwilliam. 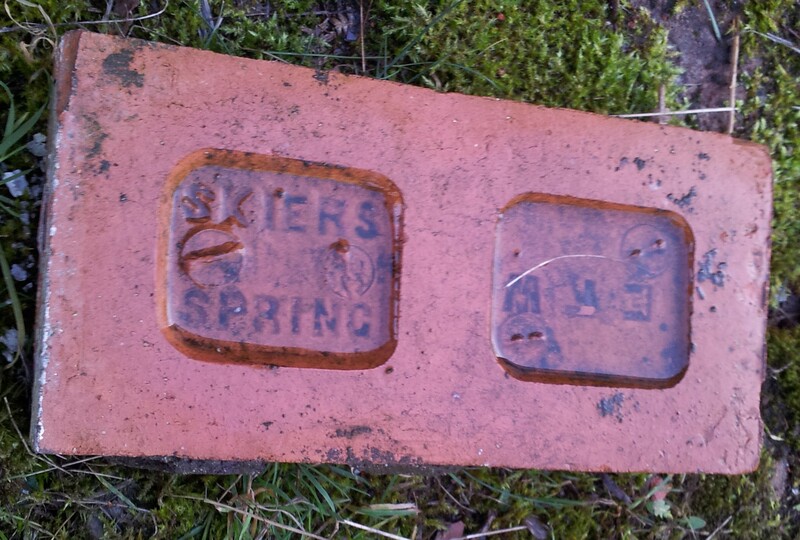 One name that stands out – it can be seen in houses around Hoyland and Elsecar, as well as towns and cities beyond – is the name of Skiers Spring – a brickworks set up in the late 1870s and based at a purpose-built site on the edge of Skiers Spring wood amongst the former ironstone workings. Long demolished and hidden by the earthworks and waste tips of later mining operations, the site can be crossed by walking down past the Lidgett Garage on Sheffield Road (itself a former colliery building belonging to Lidgett Colliery (c.1879-1912) which worked the Lidgett seam). NOTICE is hereby given, that the Partnership heretofore subsisting between us the undersigned, James Smith, Thomas Arthur Hitchmough, and William Guthrie Inglis, Manufacturers of Bricks, Tiles, and Draining Pipes, carrying on business at the Skiers Spring Patent Brick and Tile Works, situate in the township of Hoyland and Tankersley, near Barnsley, in the West Riding of Yorkshire, under the style or firm of Smith and Hitchmough, was dissolved, on and from the 31st day of December, 1877, by mutual consent, on the retirement of the said Thomas Arthur Hitchmough from the concern. All debts due and owing, to and from the late partnership will be received and paid by the said James Smith, who, with the said William Guthrie Inglis, will, in future, carry on the business, under the style of James Smith and Company. —As witness our hands this 23th day of March, 1878. By James Smith, his Attorney, duly authorized. NOTICE is hereby given, that the Partnership heretofore subsisting between us the undersigned, James Smith, William Christopher Pitts, and William Guthrie Inglis, Manufacturers of Bricks, Tiles, and Drainage Pipes, carrying on business at the Skiers Spring Patent Brick and Tile Works, situate in the townships of Hoyland and Tankersley, near Barnsley, in the West Riding of Yorkshire, under the style or firm of James Smith and Company, was dissolved, on and from the 31 at day of December, 1880, by mutual consent, on the retirement of the said William Christopher Pitts and William Guthrie Inglis from the concern. All debts due and owing to and from the late partnership will be received and paid by the said James Smith, who will in the future carry on the said business alone under the old style or firm of James Smith and Company. As witness our hands this 4th day of February, 1881. Thereafter Smith employed a manager Mr Robert Lancaster to organise the works. Lancaster was well respected and in 1883 moved down the road to take over the management of the Shortwood brickworks. The works were then under John Williamson Etches. The following descriptions speak for themselves, being an extract from an early newspaper article on the Skiers Spring brickwork site – shedding light on the origins, working methods and products. The second short piece is the obituary of the man who established the business. A stranger journeying from Sheffield to Barnsley by the turnpike, after passing through Chapeltown and descending Hood Hill, cannot fail to observe, on each side of him, immense heaps of something which would probably appear to him as useless rubbish, and, if he had spent the greater part of his life in a flat country, he might imagine that these huge mounds were artificial mountains on a small scale. So they really are, and on inquiry, he would find he is the amongst the ironstone mines. How long these have been working no one seems to know, but there is no doubt that their antiquity is very great, and we are informed that at Rockley, not far away, there are ruins of an old Roman refinery. That being so, we shall not be far wrong in arguing that these underground explorations have been going on for ages. But we wish particularly to draw the attention of our readers to the enormous mound on their right hand as they proceed towards Barnsley. This huge mound, which covers many acres of ground, has been accumulating for centuries, and is the refuse brought up from the mines, and is termed “shale” or ”bind.” Its colour is blue, fracture slaty, and in water, it moulders into powder, and up till recently was supposed to be useless and worthless. It bears a kindred resemblance to the bituminous shale, a sub-variety of argillaceous slate, which, when impregnated with bitumen burns with a flame, and when distilled at a dull red heat yields an oil of considerable importance, to which the name of paraffin oil has been given. But to return to the subject of our article. Being in that neighbourhood recently, and gifted, probably, largely with the bump of inquisitiveness, we determined to find out as much as possible respecting this mound and its surroundings. Going closer, we fancied we heard the sound of moving machinery, and on a nearer approach we found auricular organs had not deceived us, and soon we were inside what is called the “Skiers Spring Brick, Tile and Terra Cotta Works,” On making our business known to the respected manager Mr. Jno. Williamson Etches, a most cordial invitation was extended to us, to go round and freely “mark, learn and inwardly digest.” Being fortified with the necessary “Open sesame,” in we went, and for much of the information we now impart to our readers we are indebted to that good gentleman’s courtesy and intelligence. The proprietor of these works is Mr. James Smith who has carried them on for upwards of seven years. About 50 hands are employed, and all kinds of bricks and tiles are made, from the common to the ornamental, and much is also done in the terra cotta business, of which we shall speak hereafter. On entering the yard we noticed pumping engine at work, which we were told was in no way connected with the works. On all sides of us were piled up bricks of different sizes, shapes and colours, some being really ornate in appearance and artistic in design, and it seemed almost incredible that such handsome specimens of handicraft had been manufactured from that immense heap before mentioned. But it was so; that heap had been accumulating for ages, and yet, despised as it was, in reality it was most valuable, and under scientific and chemical research and experiment, its value has been brought to light. As we pursued our explorations we came upon a large number of kilns, in which the bricks are burnt. These we find in various conditions. Here is one in which men are busily employed setting the bricks, and we notice how methodically they are engaged, so as to allow the heat to pervade and perforate every brick in the kiln. When put in, the bricks are of a bluish black, and we enquire whether it is possible that those bricks, after being in there the requisite time, will come out a bright red, similar to those we saw in the yard, and we are told that such is the case. Here is another kiln, and all we can see of that is the outside. We see something very much like an entrance, but we find it is cemented up.We enquire, and find that it is just ready for lighting, the bricks are piled ready inside, and all that is now required is to set it going. But here is another one open. We enter, and soon we find that it has not long been opened. The air inside is quite hot, and the bricks warm. But what a beautiful colour, and as we take one in our hands, we cannot help wondering at the wonderful transformation which has taken place. We come upon other kilns in full blaze, and the fumes arising from them is something (to the unaccustomed) not very pleasant, But let us hurry away, and go inside the large buildings and see the different processes of manufacture. On our way to the sheds we again pass the enormous heap, and we notice men busily engaged filling corves with the shale, carefully picking out any iron-stone which it may contain. A tramway is laid from the heap to the sheds. Let us follow this man with the corve. Arriving at the entrance to the sheds we observe two huge pairs of vertical revolving wheels, which move round and round pans which are furnished with perforated bottoms. Into one of these the load is tipped, and soon it is crushed very small, the dust falling below the sieve into a receptacle below. It is then raised by elevators and carried to another sieve, in which the holes are smaller, and the smallest, which is now dust, passes through the sieve, while that which is hardly small enough for brick-making is now returned to the grinding machine to be ground over again. We now observe a boy shovelling the finest dust into a hole at the bottom of a large pit, where it is again caught by elevators and carried into another room. Here we observed it descending into what is termed the pug, and here it is first brought into contact with a stream of water which gently flows upon it. The machinery here is something novel, and our readers will better understand it if we say that the internal arrangements of it are similar to those of a sausage machine. As we have said it enters the machine mixed with water, and when it emerges it comes forth in plastic rolls, and an ingenious arrangement of eight knives cut off the requisite quantity contained to make eight bricks. These are put into a pair of inclines, down which their own weight carries them into the press, which after giving them the requisite shape, and cutting off all superfluous matter, push them toward a boy who is stationed for the purpose of removing them to a barrow standing near. Each of these barrows holds 50 bricks, which are wheeled away by a man specially engaged for the purpose. Our attention is now drawn to something which is certainly novel. We observe, by the side of this press, a handle similar to those attached to a bell rope, and we notice that every time he takes away a load he pulls this handle, and by some ingenious arrangement it registers the number of bricks which have passed through the machine. Under the press we observe a heap of remnants which have been cut off by the press, and which looked to us very much like large pieces of Spanish liquorice, though, were we to taste them, doubtless we should be quickly convinced that they were not. By and bye a lad shovels them up, and they are again thrown into the pug to be ground over again. The bricks are next taken to the drying room, which is heated by steam, and here they are methodically set up, so that the heat can pervade every brick. After remaining here the requisite time they are then taken to the kilns, which we mentioned above, and, after being burnt, are ready for building. That is the whole process connected with common bricks, and the rapidity with which these bricks can be made at the above works is such that over 17,000 have been made in one day. On our visit we found that 11,800 had been made, but the average is between 12,000 and 13,000. The better kind of bricks, however, go through other processes which we will describe. After passing through the first press, they are taken to a hand press, where each one is pressed by hand, and receives a better finish. Various dies are used for stamping the bricks and amongst those we saw were the “well brick” for lining walls, “cornice brick, dolly brick, wall coping, garden edging, dog tooth, nail head. Factible’s star brick and others too numerous to mention. We noticed above that a great deal of terra cotta work is made and we are taken to the room where this kind of work is carried on. Our attention is first drawn to an enormous piece of decorative work which is now in progress for some large public works in one of our provincial cities. It consists of a pair of abutments, with panels and pillars, and each abutment weighs not less than a ton. The modelling or carving is in bas relief, and the design is an elaborate one, and has been carried out from the architects plan in a truly artistic manner by the workman, and when finished will be truly an object of art, and will reflect much credit upon the firm. Other minor kinds of work were being carried on here, but in the smaller, as well as the larger work, there was shown the same spirit of enterprise and skill. The funeral of Mr James Smith, late of Ashcroft, near Wentworth, on 25th ult., was largely attended, some of his old workmen acting as bearers. The deceased was 66 years of age, and had suffered much during the last year of his life from paralysis. He came of a well-known family of shipbuilders and owners of Scarborough, where he was born in 1840. He commenced his business career as a coffee planter in Ceylon, but, owing to ill-health and the leaf disease, he returned home in 1867, and became secretary to the late Mr Davies [should perhaps be Dawes? ], at the Milton and Elsecar Ironworks. While there he discovered the uses of ironstone shale, and in 1877 founded the now well-known Skiers Spring Brick and Tile Works. For twenty-five years he was the organist as Wentworth Church, and he will be much missed by his many musical friends. He was an enthusiastic musician being the composer of various church music. Later the works were managed by Mr Smith’s son, Gilbert Thornton Smith (1869-1947).